In math, we are learning the concept of tally marks. 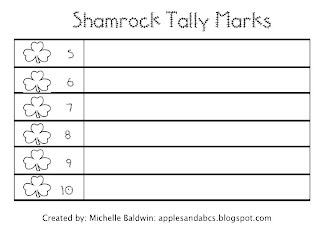 I thought of a fun center in which the students can match the shamrocks with the same numeral and tally mark. To see how you can use these shamrocks in 4th grade, head on over to Lessons with Laughter! I bought foam shamrocks from the Dollar tree and puffy painted pairs with a number and same amount of tally marks. The students will find the matching pairs and put them together. Thanks for checking out my blog today! Your blog is adorable too! I team teach with a Kindergarten teacher during our Intervention time on Fridays so I'll be back to check out what you're up to with your cuties! I finally got the shamrocks and created a multiplication memory game inspired by this post!!! Thanks so much for the inspiration! And I linked back to your blog! Come check it out!